Two Monday polls showed wildly different projections in Alabama’s Senate race. One poll, from Fox News, showed Democratic candidate Doug Jones with a 10-point lead over Republican Roy Moore. The other, from Emerson, showed Moore with a 9-point lead over Jones. The differences could have a lot to do with the polls’ methodologies. Two polls released Monday showed a wildly different Senate race in Alabama as it speeds toward Election Day on Tuesday. The first, released by Fox News, showed Democratic nominee Doug Jones with a whopping 10-point lead over Republican Roy Moore. That represented the largest lead Jones has held over Moore in any major poll released since Moore was first alleged of sexual misconduct with teenage girls when he was in his 30s. 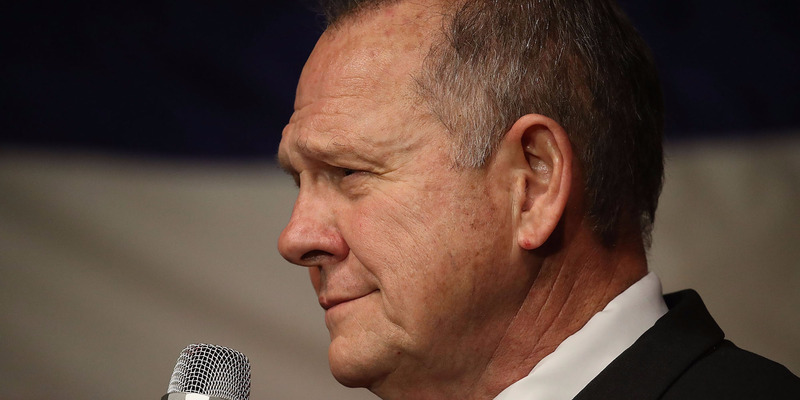 But at the same time, Emerson College released a poll that showed Moore up 9 points, which happened to be the second-largest lead he’s held since those allegations broke last month. For starters, the polls had entirely different methodologies. Fox News conducted a live interview survey over using a mix of cell phones and landlines. In the three major live interview polls conducted since the Moore allegations, which included two from Fox News and one from The Washington Post, Jones has held leads of 3, 8, and 10 points, respectively. Emerson, on the other hand, was automated, polling Alabamians on landlines and online. A couple of factors could be at play with that difference. For one, respondents could opt against telling a live pollster they were voting for Moore while feeling fine with saying so in an automated survey. That plays into what is known as a “social desirability bias” that can affect the outcome of polls in races where one candidate is seen is less socially acceptable to vote for. Meanwhile, the demographic mix of respondents could be significantly different. For example, Jones was plus-30 points with Alabama voters polled by cell phone in the Fox poll, while he was about even with Moore among those polled via landline. For Fox, the number of Republicans in its pool of registered voters and likely voters dropped off from its mid-November poll by 2 and 4 points, respectively. Meanwhile, the number of Democrats stayed virtually the same in both pools. Fox polled a sample of 1,408 registered voters and a subsample of 1,127 likely voters. As polling analyst Harry Enten of the data-journalism website FiveThirtyEight pointed out, the Fox survey showed Jones performing 4 points better with likely voters than with registered voters, something he said other pollsters have found in reverse. A problem facing pollsters is the sheer number of factors that make turnout difficult to project in a special election held in December, in a heavily Republican state at a time when Democrats are fired up both in opposition to Trump and to Moore. The allegations against Moore, which he denies, have caused Republican voters to double down on their support of Moore or step back from the race, possibly even moving over to the Jones camp. “This appears to be a special, special election with blacks and young voters animated by a caustic Republican candidate and the chance of winning a statewide election with national implications, and at the same time some Republicans and many moderates are turned off by Moore, too,” said Democratic pollster Chris Anderson, who conducts the Fox News Poll with Republican pollster Daron Shaw. Later Monday, Monmouth University released its final survey of the race. It showed Moore and Jones tied.